I have to admit, Mary, your idea of opening the "best restaurant in the world" seems very ambitious, but not very well thought out. Why's that? You're a first-class chef, you graduated the most prestigious cookery school in the world with honors. And I can get through to practically any customer. Because it's not enough to finish school, even with honors. There are lots of secrets in the culinary world that just aren't taught in school. Well, that means we need to find someone who will teach us the secrets! 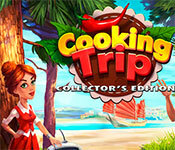 This game has a free trial version, click to start Cooking Trip Collector's Edition Free Download. If you like it, please buy the full version to support the developer, thanks.